Dr. Cary Feuerman and Dr. Giovanni Castellucci have placed thousands of dental implants in Framingham and Newton, MA since 1988. 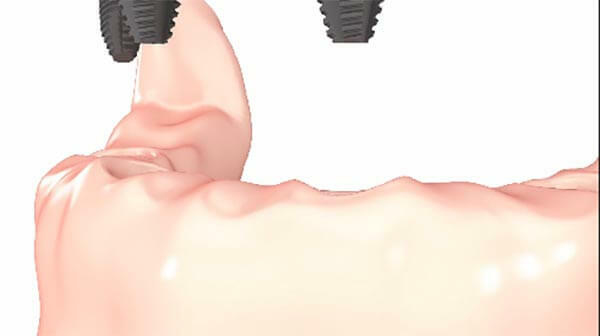 In the “early days”, implant dentistry followed a traditional treatment sequence and could not be used to support replacement teeth until a few months of healing had gone by. Now, because of remarkable advances in implant technology, replacement teeth can be attached to the dental implants on the same day that the implants are placed – all in one appointment! 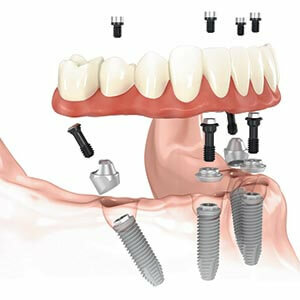 Contact us today to schedule your All-on-4 dental implant appointment. The All-on-4 procedure allows us to replace a full upper or lower arch of missing teeth using just four implants as anchors. 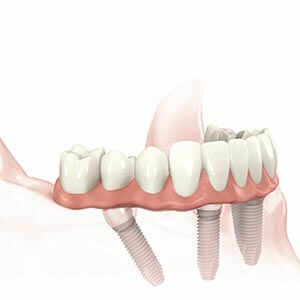 Dental implants actually osseointegrate into the jawbone, preventing the bone loss that causes the sunken look in many traditional denture wearers. In addition, there is no plastic palate on the roof of the mouth, allowing you to speak and eat more comfortably and naturally than is possible with a denture. Because the All-on-Four is a fixed, permanent solution, it looks and feels just like natural teeth. You will not experience rocking, slipping, or pinching. You can eat whatever you like, and brush your teeth as normal. 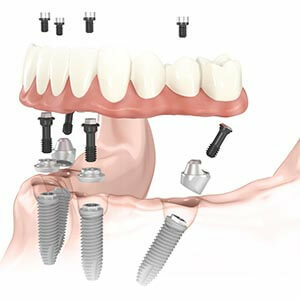 Since the entire dental implant restoration is placed during a single visit and uses just four implants, both cost and healing time are significantly lower than with previous implant solutions. Dr. Feuerman and Dr. Castellucci are leaders in full mouth restoration using just four implants. As compared to approaches that require more implants, patients treated with the All-on-4 process experience similar success rates at a lower cost and shorter healing time. Our patients restore their chewing function, confidence, self-esteem, and beautiful smiles in just one appointment! Are you ready to restore your mouth in a single visit? Ask us whether All-on-4 is right for you. Contact us today to learn more the All-on-4 procedure.